"It comes bringing much buzz, fresh off a Grammy Award for best opera recording, and a 2017 run at Santa Fe Opera that met with standing ovations and high ticket demand. Perhaps more importantly, in terms of drawing people who’ve never attended an opera performance, it has name familiarity. Usually, in opera, that means the composer: Mozart, Puccini, Verdi. In this case, though, it’s the title subject, a man whose name reverberates not just in tech towns like Seattle and San Francisco. 'Everybody is carrying a little bit of Steve Jobs in their pocket,' said Composer Mason Bates..."
"Still, creating a work of art for a form where longevity is measured in centuries, not smartphone upgrade cycles, did require librettist Mark Campbell to think hard about what to leave out.' We decided really early on not to mention any products by name,' he said. 'We talk about the iPhone in the first song — the first big number is a product launch — but we don’t say "the iPhone." We don’t talk about the Apple One computer or anything like that. That would kind of date the language.' Even Apple’s corporate nemesis gets the silent treatment. Microsoft is only referred to as 'Seattle' or 'the big M.'"
"Even people who, like me, hate anything that makes capitalism appear to be anything but ugly can't avoid the fact that Jobs had about him the air of an exceptional person. There have been books and films made about him, but I believe that the proper medium for this type of life is opera. It will be interesting to see what The (R)evolution of Steve Jobs looks and sounds like in Seattle Opera's production ... With music by Mason Bates and a libretto by Mark Campbell, The (R)evolution of Steve Jobs understands that no other medium than opera is appropriate to the life and times of a man many considered to be the last hero of capitalism." "Scenes from the life of the tech visionary (his mentor, his colleague Steve Wozniak, his romances) are recounted in flashbacks in Mason Bates’ Grammy-winning opera The (R)evolution of Steve Jobs—both a showcase for electronic musical and visual affects and a warmly intimate portrait of a troubled genius." "When you hear the name Steve Jobs, what’s the first thing that comes to mind? Apple founder. Tech genius. Opera fodder? That last one seems less likely. 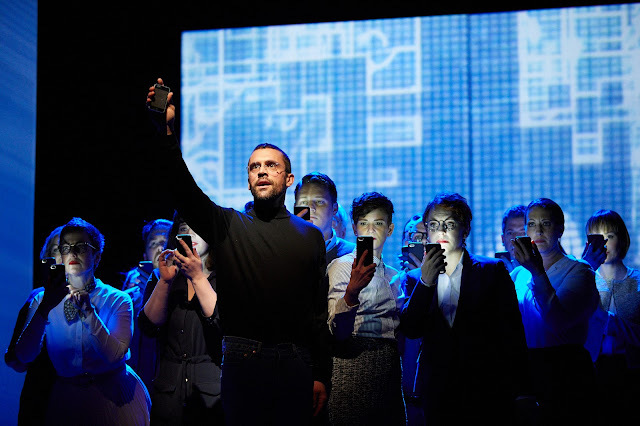 But the reviews are in and The (R)evolution of Steve Jobs is a hit. It just won the Grammy for Best Opera Recording (by the Santa Fe Opera) and is about to make its West Coast debut at Seattle Opera." "Final rehearsals are underway at Seattle’s McCaw Hall for a new show debuting this weekend for Seattle Opera. It's a revolutionary take on an art form that is steeped in tradition, but they hope it could catch the attention of a new audience. Seattle Opera's repertoire is known for an impressive selection of shows, but this week it's their final rehearsals on a new show. It’s a production that’s only been seen in a few cities, and it's quite unique. 'It's going to be different than anything you've seen on stage before,' performer Sarah Mattox explained. The stage is filled with video screens, and the star wears jeans and a black mock turtleneck for the whole show." Seattle Opera has been fighting against opera’s reputation as a mummified art form for a long time with its progressive chamber operas and in the audience education programs around the regular season productions. 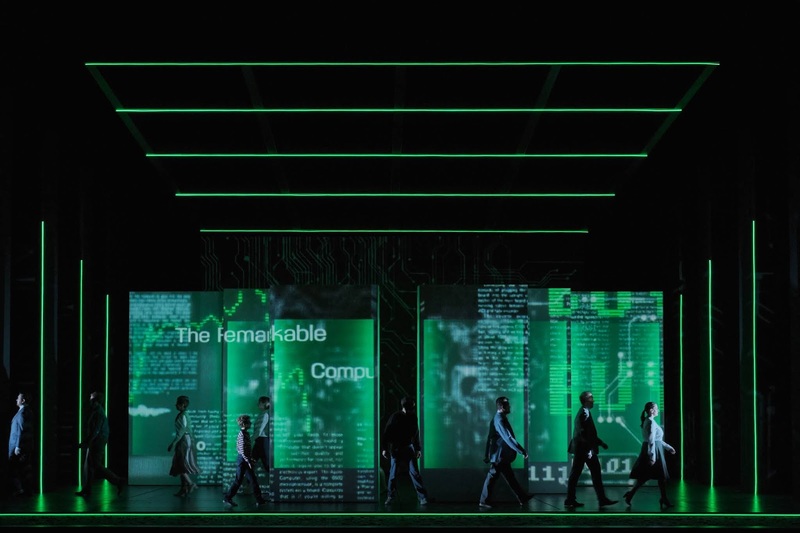 With Steve Jobs, they are elevating the themes of contemporary opera to the main season stage, replacing misbehaving royals with a tech tycoon. Could anything be more relevant to 21st century Seattle than a story that examines the impact of technology on our community and even our minds?